Just wanted to share some of my new stuff I got in the mail this past couple of days. Last but not least I wanted to inform to howlelujah, smittenlotus, and cyritic that I have sent your items this Tuesday so it should be on its way. So I'm closing my shop next week, and everything will be packed up for the summer. Still lots of neat plush, figures, charms and other such things! And everything paid for was shipped on monday! 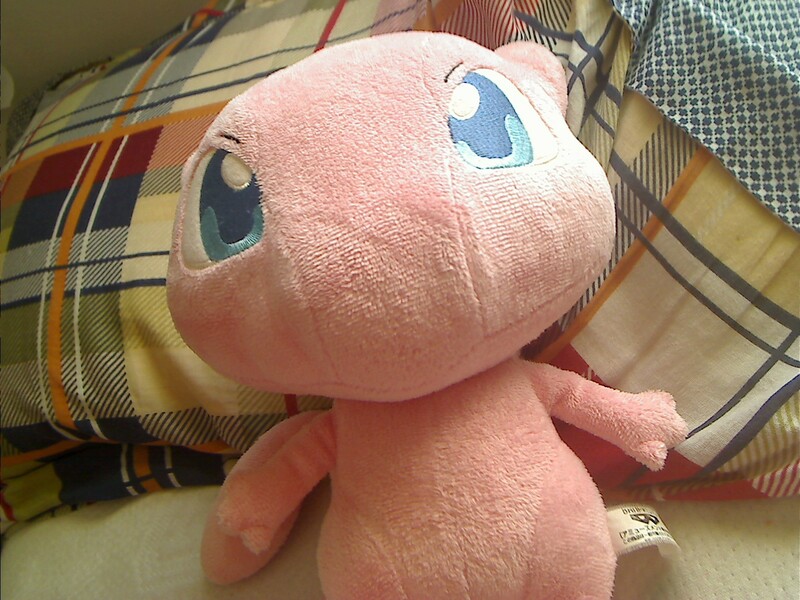 So I won an auction on ebay for some used Pokemon plushes that I am really excited about, but there is one concern. In the item description, the lister said that they would wash all of plushes before sending them, and I guess I assumed that they knew how to wash them properly. After I won the auction, I got a message from the lister in which she said, "they are all i the dryer now," which I assume she meant to say out of the dryer. Eeeeeee! I didn't think that you were supposed to put them in the dryer! 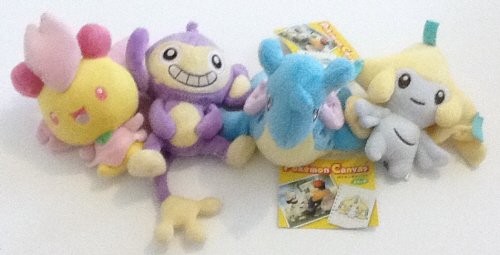 The main reason I bought the lot was for the rare Bayleef plush, so I am concerned about him now. So my question is, does putting plushes in the dryer ruin them, or do you think they'll be okay? If anyone has experience from this, please let me know. Thanks. GRAAIL GET!!! + my biggest want! He's here! My little precious is here! I've been staring at him since I got home a few hours ago, and I'm so happy. He's so darn cute, and I'm putting him through a sort of photo shoot with my new phone that came in the mail yesterday. Two excellent days in a row. Now, you get photos. Well, it's minor, but neat. Ever looked at your collection and thought, "wow, I must be really weird to have bought that for my collection!" Maybe it's an uneaten cookie with a Pokemon on it, maybe it's a pair of kid's boxers, and maybe it's... socks? If I can take a photo of the codes/QR codes for you, it will be $20 total. Otherwise I can ship them to you for whatever shipping will be on that. This makes it about 30 cents per code. Haha I got a BUNCH of metal figures in the last few weeks and I thought I'd share them! I BET I have at least one metal figure you haven't seen before! (This was the first time I'd seen a handful of them! 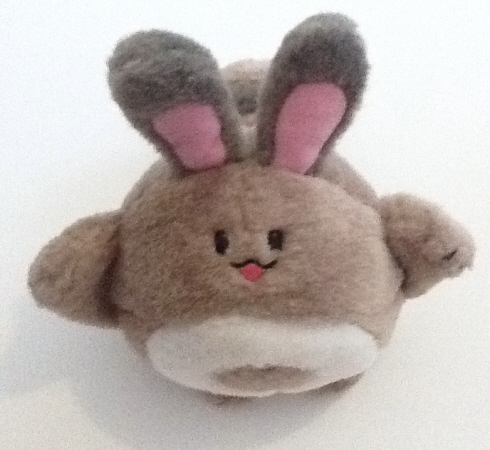 I know one of my post is still up from yesterday but I wanted to get this plush out of the way and in to a new home. Hey guys I just came back from my local shop and wow I saw the magazine for July. 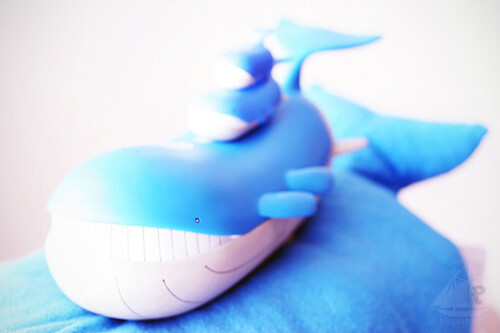 The amount of merchandise banpresto is releasing is mindblowing XD And I've got pictures of all of them for you! You can click on each of the pictures to get a bigger photo of it. And YES ALL OF IT apart from the Museum figures ARE RELEASED IN JULY, the movie month! First up is of course the posters of the main movie as well as the meloetta movie special (Is that what its called?). You'll be surprised, but that meloetta movie will be getting merchandise especially of all of the OLD GEN POKEMON! Read on to find out! 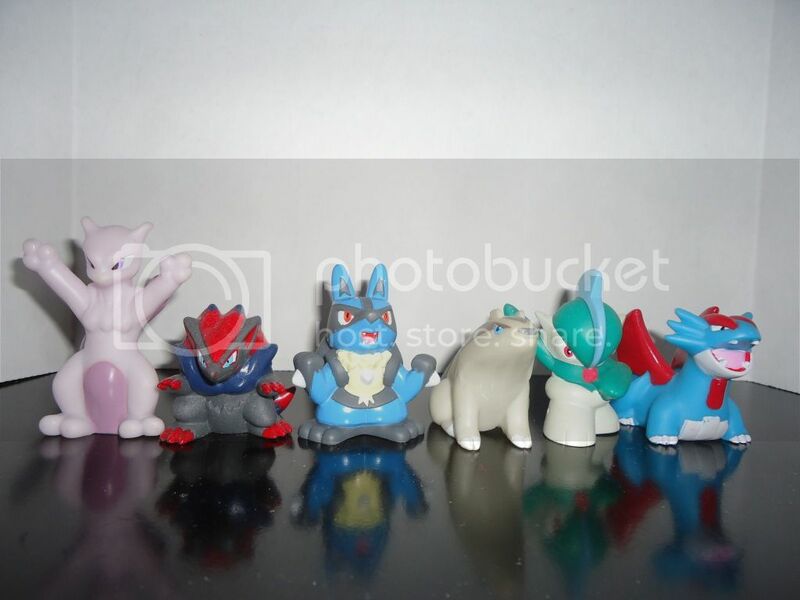 Banpresto keychains of all the awesome movie legendary Pokemon. 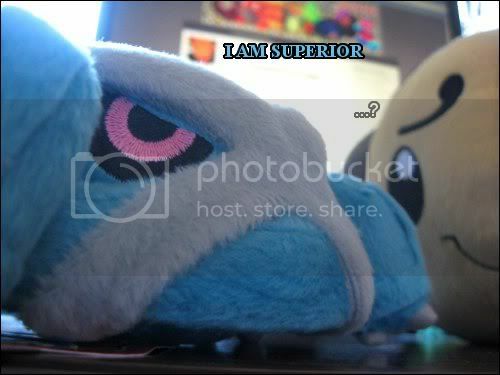 I would say White Kyurem looks BADASS. Also, the next set of battle museum figures will be out in August! The picture is a little bit blur I know, but it consists of Axew, Bisharp, Deerling and Krookodile. I can't wait to get my awesome bisharp figure. I will post a better picture when I find one so don't worry. BAM! 18CM KELDO FIGURE! I bet it's going to be crazy for this one. I will post up orders for this closer to the date. The Lovely Zweillous in basking in its glory. Thank you all for reading, I hope you enjoy the new merch info! Tyranitar items wanted, Sales update, and Collection update! First: I am seeking the below Luxio TCG, and Tyranitar flat items I do not have :O The ones I have are posted in the cut at the bottom of this post! 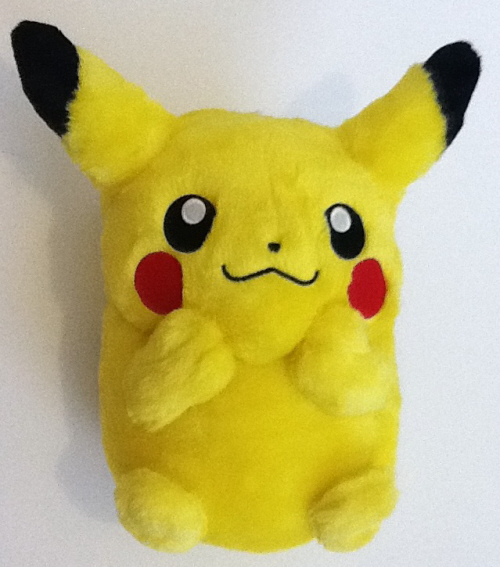 Second: I've discounted plush prices at my shop, and added more NWT Pokedolls + Banpresto UFO plush, and Tomy figures. 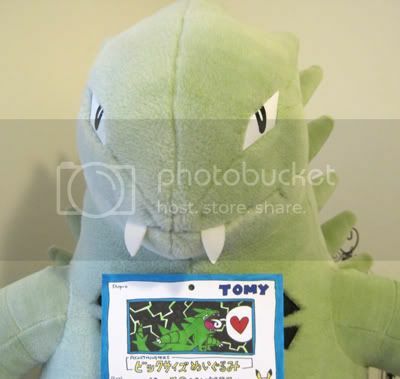 Thirdly, and most interestingly: My Pokemon Center Giant Tyranitar's eye switch and restoration has been complete for awhile now, and I finally got some half-decent photos :) Custom tag a gift generously given to him (not me XD) by blackdog333~! Click me to see some much nicer outdoor photos! Different link: See progress of his restoration! Hey guys I received my Nobunaga package today after a much anticipated wait and unfortunately I can't describe this package with any words other than disappointment. :( more under the cut along with a Nobunaga+Zekrom figure review for those who have been on the fence about it. Bandanna Mew + GA helper? 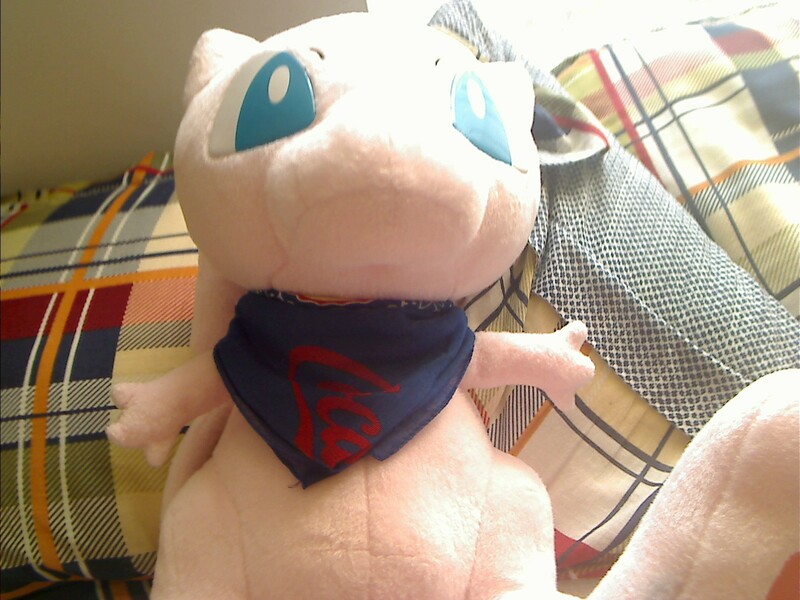 I also want to add an accessory to Pink'r, my DX Mew Plush. What do you think will suit her best? A ribbon bow? A spiked choker (lol)? And just for fun, here's their "home". Would anybody be interested in helping me if I show it to them? Oh yes, I also have sales permission granted to me by entirelycliched on April 2, 2012. Linoone would be my pal, like the Pikachu to my Ash. x3 We would ride on Salamence, and the others would be like...I don't know, my drinking buddies or something. XD Except Lucario. He's very moral and only drinks water and energy drinks. White mini-posterboards make AWESOME photo backgrounds by the way :D It was so worth the two bucks I spent on it. Basically Noppin is not my best friend right now! Totally forgot to show off my Plusle and Eevee! Eevee started hiding in my mom's mini coffee basket! I will end with free ice-cream and Mewoodles for everyone! So, my purpose here today is... I gots mail! And I also bring you a service annoucement from your friendly neighbourhood Revolver Oshawott (see: end of the post). I didn't expect to get this grumpybutt until next week so he was a lovely pick-me-up! But who's creeping behind him...? As well as your other battery-operated friends!" 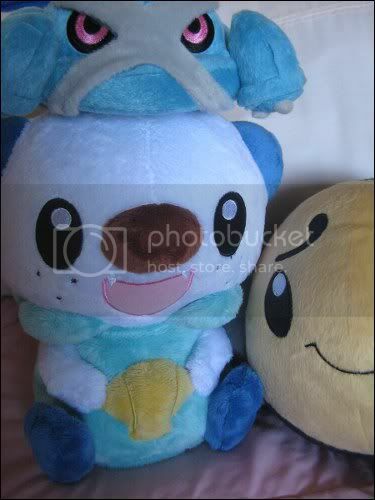 I'm looking for either a bibarel or a bidoof stuffed animal. it doesn't matter if its the japanese one or the american ones. i guess as long as its bidoof or bibarel. Thanks for looking at meh Fancy Ditto! New Arrivals! Welcome to the neighbourhood! #2 ++ QUESTIONS! and I do have a question at the end! QUESTIONS AND UPDATE BEHIND THE CUT! My friend's birthday is coming up so I'm looking for a reasonably priced Luxray charm, full set or just the one, either way. :D I'm in the USA so if you could include how much you speculate shipping to be in your asking price that would be super. Let me know, thanks!